Some more outstanding MyRepublic speeds straight from Gigatown at 9pm on a Saturday. I'm so happy they have all that extra bandwidth per customer and the fact that it is a peak time isn't slowing me down... But really, so sick of there rubbish. Wish I could break contract. 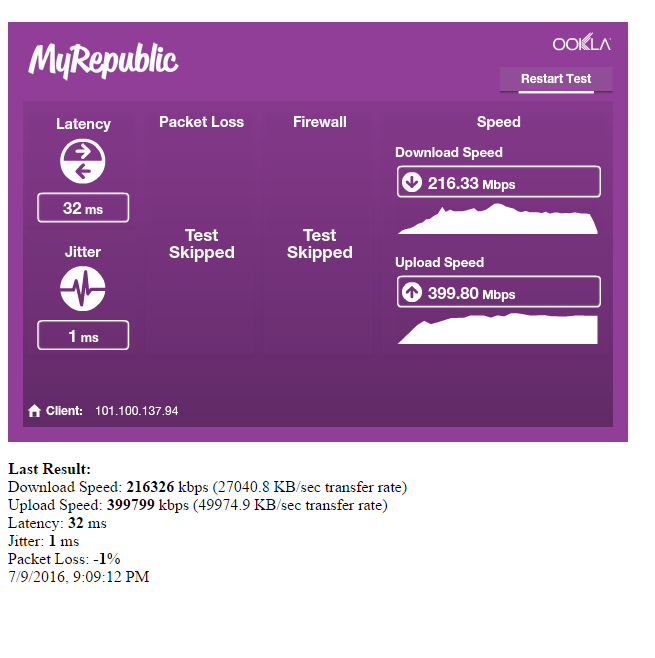 My VDSL speeds tonight and most peak times with MyRepublic .. It should be at gigabit speeds - 1000 Mbps. Everything seems ok these days. Will try some tests to some interational sites. Argh don't say that I have only just swapped to them before i read this forum. Seriously try to leave them now. Most ISPs have a grace period which of I were you would be using to leave them ASAP. If it is that slow then log a fault. Keep records. Give ultimatum to sort it, leave.